The apostle prayerfully turns to the heavenly Father. He seeks and expects help and success from him only. Are the Ephesians not to cool off in their joyful trust towards God, and is the edification and flourishing of the Church in this world to remain their main concern and priority, then they must comprehend the unending mercy of the triune God. That is why the love of Christ, which surpasses all else by far – and the encompassing profundity of the divine treasures must continually be revealed and expounded to them. The apostle pleads that the Christians in Ephesus will attain a high, innermost and blessed level of insight and confidence in the divine love and providence. That is why he bows down before God, kneels before the Father of Jesus Christ – who has given name, example and model to every fatherhood, family and all children in heaven and earth. He’s considering all fatherhood, all families and descendants on earth in his prayer. It reminds him of the holy Christian Church too. He thinks of those families already completed and fulfilled at home in heaven. He does not forget those still on earth. He sees them incorporated into the building of the divine Church and body of Christ. And he calls on the Lord of the Church, that he be merciful and gracious to the Church in Ephesus. Because he would have them profound insight into the wide and deep riches of God’s treasures that’s why he calls on the Father of all that he is to act and deal with them according to his glorious wealth of grace and mercy and so bless the Ephesian congregation by giving ear to his prayer. 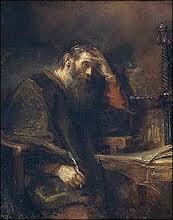 In that case the Ephesian Christians would not tire of St. Paul’s suffering either. Almighty, heavenly Father! We thank your most holy name that you revealed the fullness of your divine riches and your profound love for us in your Son Jesus Christ through your holy apostles. We plead you from the bottom of our heart, rule us through your Holy Spirit, that we would follow their apostolic teachings, faith and patience most faithfully and persist therein until the end. Through Jesus Christ, your dearly beloved Son our Lord. Amen. Speak, O Lord, your servant listens, Let your Word to me come near; Newborn life and spirit give me, Let each promise still my fear. Death’s dread power, its inward strife, Wars against your Word of life; Fill me, Lord, with love’s strong fervor That I cling to your forever! This is a rather free translation of Wilhelm Löhe’s devotion for Monday after the sixteenth Sunday after the high holiday and festival of the Holy Trinity. It is found on Pg. 328 in Lob sei Dir ewig, o Jesu! (Eternal Praise to you o Jesus!) edited by A. Schuster and published in the Freimund Verlag, Neuendettelsau 1949. This entry was posted in Meditations by P.Wilhelm Löhe (Translation) and tagged Church, concern, Congregation, Earth, edification, Eph 3:14-15, Father, heaven, Kneel, Mission, Prayer, priority, Revelation. Bookmark the permalink.